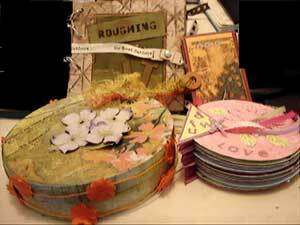 So what if you can't get to a scrapbook workshop? With video tutorials, the workshop comes to you! Now you can enjoy a workshop experience in the comfort of your own home! Now you can create the projects you've dreamed of making -- when you want, where you want and as often as you want! And now the instructor is always available to demonstrate each step of the way -- even at two in the morning, if that's when the creative urge strikes you. Creating new projects is so easy with video instruction. These scrapbook video tutorials make it so easy for you to create the projects you've always wanted to make. No matter where you live, no matter how awkward your schedule, you can follow these videos at your own convenience to make interesting, innovative projects that you'll show with pride. And, because not everyone has access to a thoroughly stocked craft store, these projects use generic supplies that you can find anywhere -- even the Dollar Store! The Diamond Crafting Video Tutorials for Christmas and the Holidays ... projects to ring in the joy of the season. The Ruby Videos are all about hearts and love and Valentines Day. Whether its a special someone, a child, a parent or a good friend, these projects say, "You hold a special place in my heart".